My daughter was a fussy, colicky baby. She hated her swing, bouncy chair, baby carrier, crib, playpen, and bucket seat, and I spent many nights rocking her with the vacuum blasting at full force. I remember feeling envious of the other moms I encountered each day as I watched them INSTANTLY calm their crying babies by placing a pacifier in their mouths, but try as I might, my little one was absolutely not interested, and since I wasn’t really one for public breastfeeding, I often timed my outings around naps and feedings to avoid potential meltdowns. Of course, hindsight is always 20/20, and as I think back to the things that caused me so much stress and anxiety during those first few months of motherhood, I start to laugh so hard I cry down my leg. But when I was too sleep-deprived to remember my own name, everything seemed like such a big deal to me, and I would’ve given anything to have one tool (other than my own body) to keep my little bundle of joy happy so I could make it through the checkout line at the grocery store, finish a meal, or pee. The good news is that, even though it took longer than my husband had hoped for my hormones to level out, I am a much more rational human being these days, and when I was flipping through my Facebook feed yesterday, I saw a post from an old high school friend of mine who was celebrating her daughter’s first night sleeping without her pacifier. As it turns out, helping her daughter get rid of the pacifier has been a HUGE struggle for my friend, and while they have made a ton of progress, she confided in me that she has always been jealous of moms like myself whose children refused to use crutches like pacifiers and thumb-sucking to calm themselves. I then told her about my own jealousies around children who self-soothed, and after we stopped laughing, I asked if she could share some of her best parenting tips to help kids (and parents!) ditch the pacifier. Gently wean your child off the pacifier by limiting the times the pacifier is used (i.e. nap times and bedtimes). You can also limit the pacifier to a place like a crib or toddler bed, and then, when your child is ready to graduate to a bigger bed, you can remove it altogether. Talk with your doctor about a safe product to use to make the pacifier taste bad (i.e. pickle juice). This is the same method to use to deter nail biters. The idea is that the child will correlate the bad taste to the pacifier. Sometimes the excitement of growing up can be enough incentive to give up the pacifier, and you can mark this milestone by making a ritual out of trading the pacifier for a special toy your child wants. For an older child that can understand the concept of donating to another child, you can give the pacifier to the Pacifier Fairy. Babies use the sucking sensation to soothe. 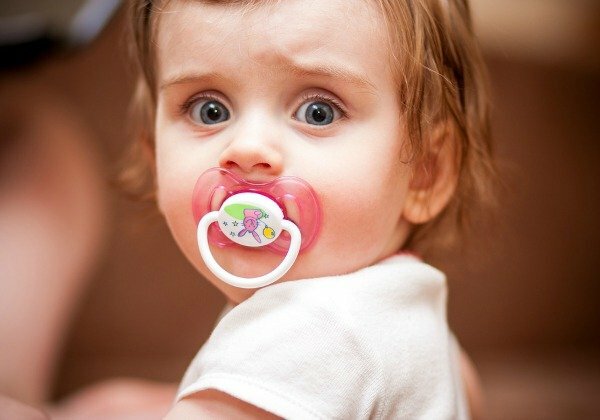 Once you notice that your child is no longer using the pacifier to sooth you can take it away gradually (or cold turkey!) at a young age. The idea is that after a few days the baby will no longer remember having the pacifier to soothe. Some parents sabotage the pacifier in different ways so it is no longer usable. The only concern here is that they become a hazard, so be careful! Have the child each cash for something desirable each day/night/naptime they go without using the pacifier. This could be a new toy they want, or a trip somewhere special. Make the transition fun and educational. By singing and reading about it you can show that it is normal to give the pacifier away and that it is something all kids do. The pacifier is something that soothes, and children start to make that connection, so help your child find other ways to soothe themselves. Have you ever seen a child in middle school or high school with a pacifier? I haven’t either! As long as your dentist and doctor do not have concerns about your child being on the pacifier, you shouldn’t worry either. 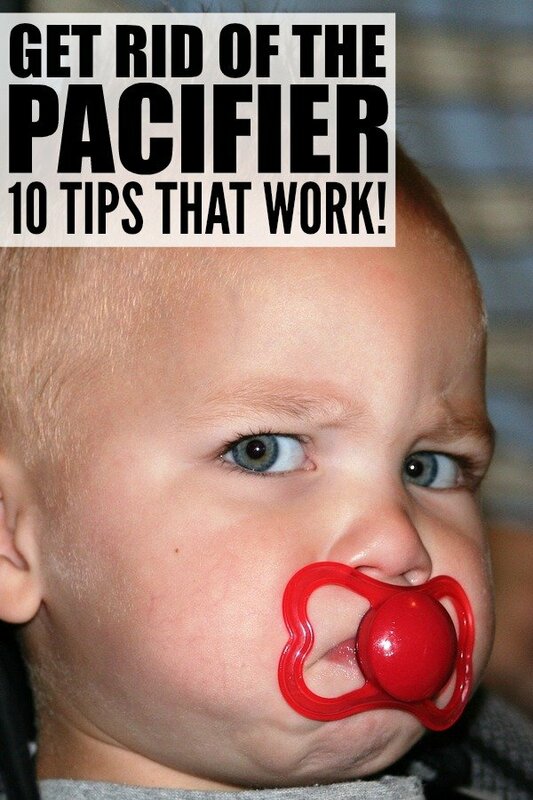 If you found these tips to help your kids get rid of the pacifier, please share them on Pinterest! And if you’re looking for more parenting advice, please follow our Parenting board where we share all kinds of fabulous tips and tricks!